So, have you been wondering what you'll eat when you head out to the Texas State Fair, or are you just wondering what sort of strange and unusual stuff you can find there? In 10 hours, we chronicled all these edibles under the Texas Star. It's also for the new sensation this year, the Deep Fried Taste of Autumn Pie, which is pumpkin pie filling between two layers of ginger snaps, battered, rolled in more ginger snaps and deep fried, topped with cinnamon and sugar and spice and whipped cream. 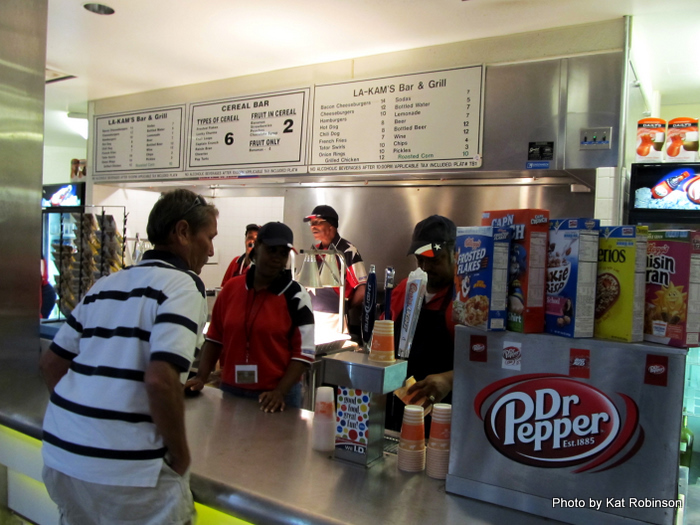 You'll find it at the Stiffler Brothers stand on the east side of the Cotton Bowl, catty-corner from Hans Mueller's. 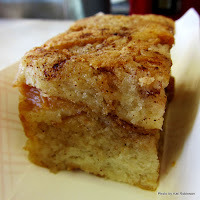 B is for Bread Pudding, which shows up a lot of different places at the Texas State Fair. 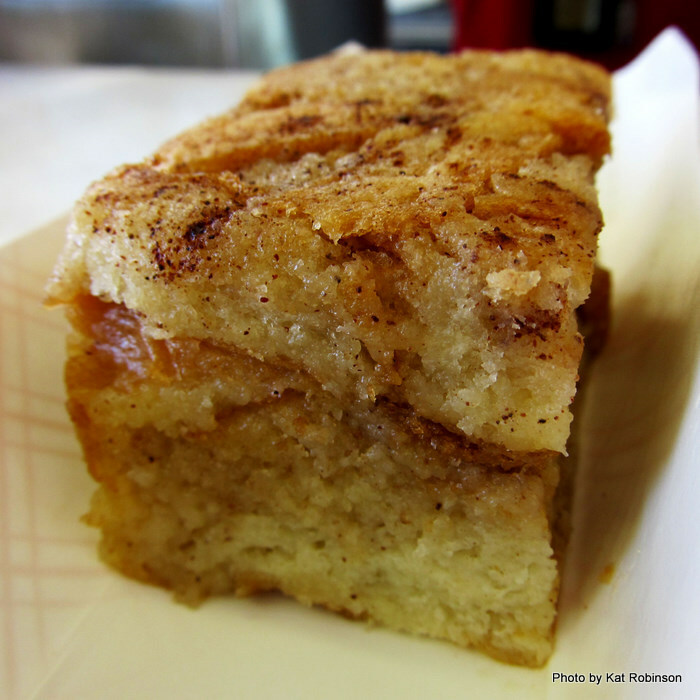 Newton’s Concessions (several locations all over the fairgrounds) has a version called the Awesome Bread Pudding. It’s a cinnamon packed pudding that’ll fill you up. This is what it looks like “naked;” it also comes with a nicely spice-full rum sauce. 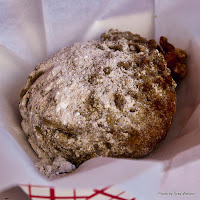 Another version can be found at the Caribbean Foods place over north of the Magnolia Beer Garden, where they sell a Fried Bread Pudding. 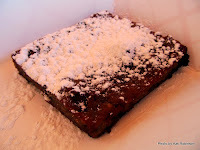 It’s a condensed slice of bread pudding fried in butter and sprinkled with powdered sugar. It’s a small sweet, but at 5 tickets ($2.50) it’s a cheap treat. Then there’s El Bananarita -- one of the hot new foods at the Texas State Fair. 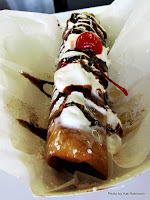 It’s a banana wrapped in a flour tortilla, deep fried and covered with Sugar, cinnamon, honey whipped cream, chocolate sauce and a cherry. 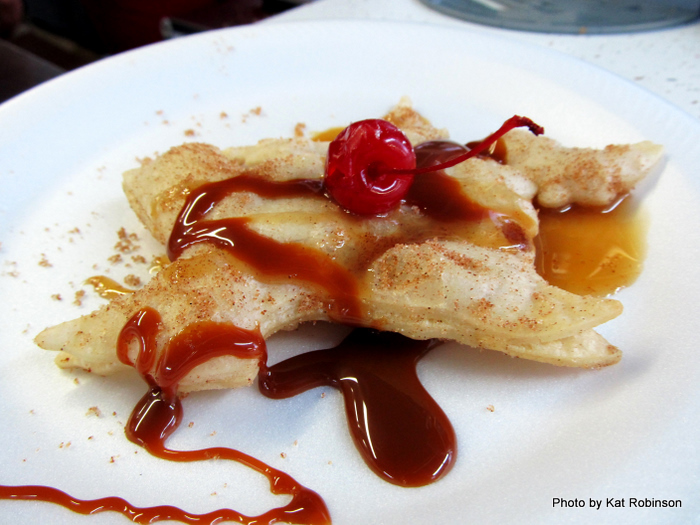 We’re talking serious dessert here for 10 tickets ($5) at the Funnel Cake Stand on Fun Way in the Midway area. 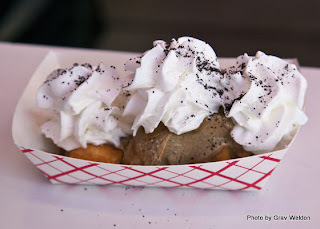 And then there's the Deep Fried Biscuit and Gravy. This is actually more of a soft roll filled with white cream gravy (no meat) like a filled doughnut, dipped in batter and deep fried. We were surprised to find it was actually a meatless entry. The frying process brings the cold gravy up to medium warm temperature. Created by the Belgian Waffle people who brought you Fried Beer last year. C is for Cereal, which gets its own wacky entry. You’re not going to hear much about the Cereal Bar. No, it’s not a pre-made cereal bar that's been chocolate coated or deep fried or anything like that. Nope, it's cereal. Seriously. You have your choice of Frosted Flakes, Captain Crunch, Lucky Charms, Froot Loops, Raisin Bran, Cookie Crisp or Pop Tarts (yeah, the last one's not a cereal but it's up there) -- and that's it. 6 tickets with milk... that's $3. But here's where it gets fun. For an additional 2 tickets ($1) you can have added in bananas, peaches, strawberries and/or chocolate syrup. Unusual, especially since nothing is deep fried. At La-Kam's Bar and Grill in the Coca-Cola Food Court. C also stands for cornmeal batter -- which is always popular. 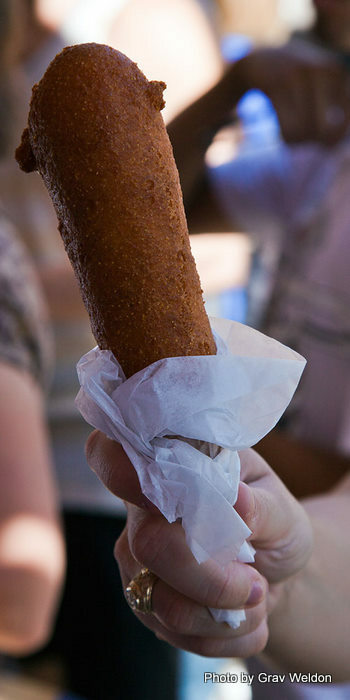 This year Fletcher’s Original State Fair Corny Dogs (by far the best known of the corn dog vendors at the fair) is selling Jalapeno Cheese Corn Dogs for 11 tickets ($5.50). They’re the original dogs, but with jalapeno seasoning and cheese inside. 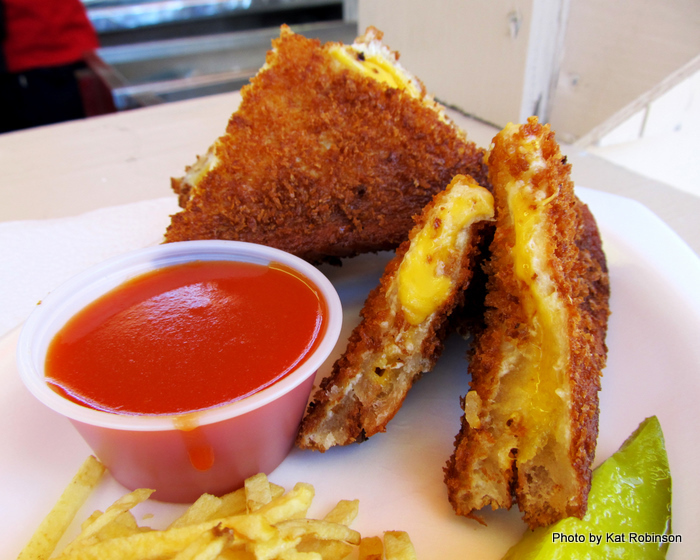 You can even have yours dipped in nacho cheese sauce. Fletcher’s also offers a Bird Dog that’s made with a turkey weiner for 9 tickets ($4.50). 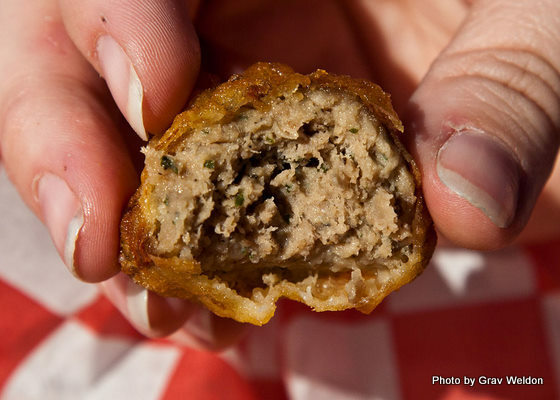 Then there’s the Critter Fritter, a cornmeal-packed ball of goodness. 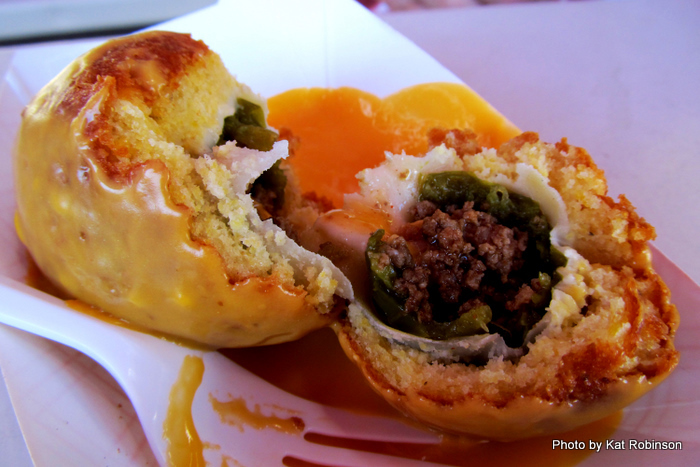 Start with a jalapeno pepper, stuff it with ground beef and Cheddar cheese, wrap it in cornmeal and deep fry it and cover it in nacho cheese. You can pick one up for six tickets ($3) and have a ball. And there's the Cowboy Philly. It's a cheesesteak loaded up with lots of ground beef, onions, bell peppers and mushrooms. 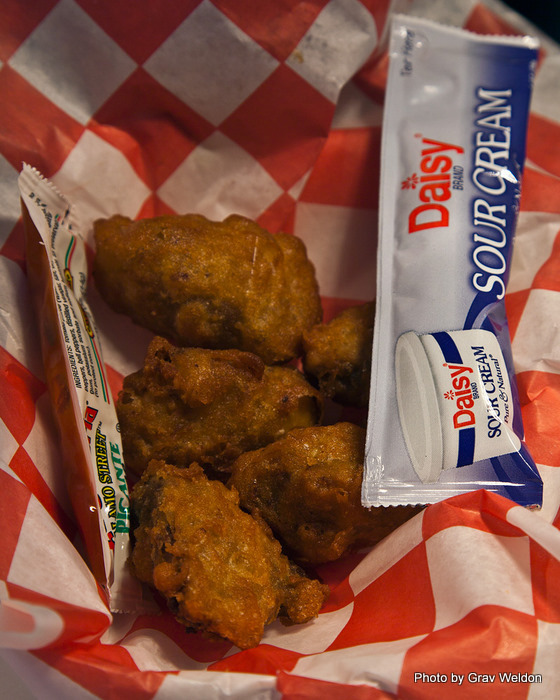 Comes in varieties, too -- you can have it with chicken instead, or have it spiced with lemon pepper or barbecue sauce. This is the Hot Hot Hot version, as evidenced by the pepper seasoning. It's 16 tickets ($8) at Cowboy Style Philly's in the Coca-Cola Food Court. 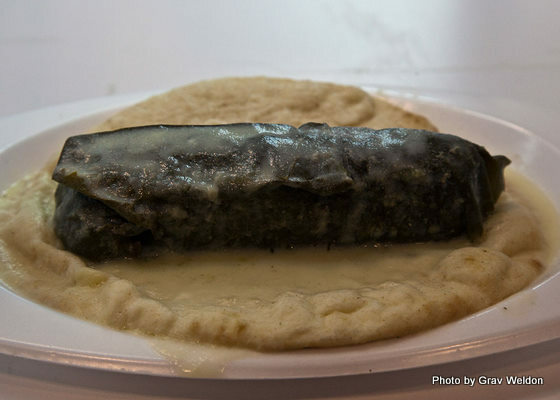 D is for Dolmas, as in the gigantic Dolma you’ll get at Thanasi's Authentic Greek Fare. This is a seriously large dolma made in a seriously large grape leaf, six inches long and served up with Greek sauce on a homemade pita. It’s filled with beef and lamb and rice and it’ll fill you up. It’s just 12 tickets ($6). It's also for Donkey Tail. 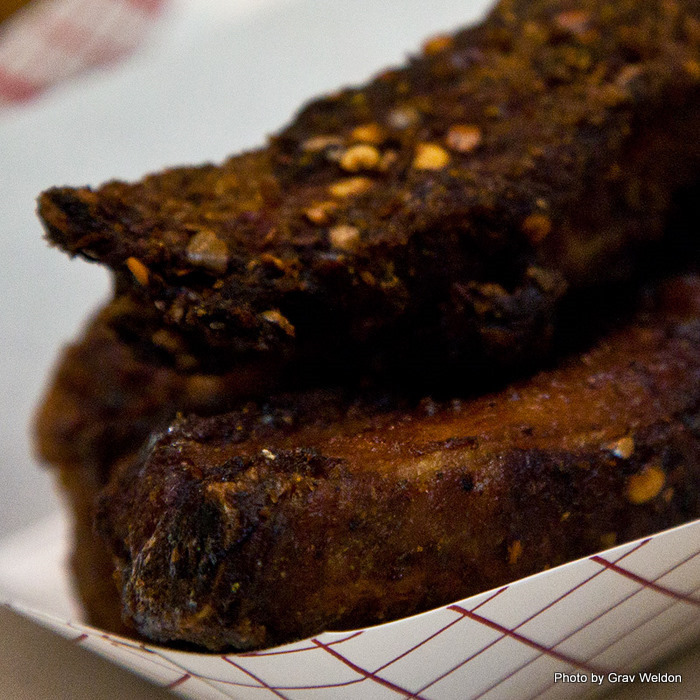 The folks at Smokey Joe's BBQ came up with the idea that won a Big Tex in 2006. 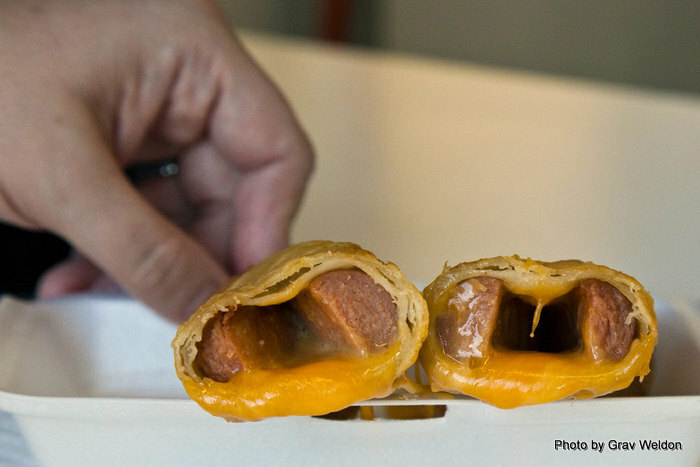 It's still popular -- a beef weiner split and stuffed with Cheddar cheese, wrapped in dough and deep fried. 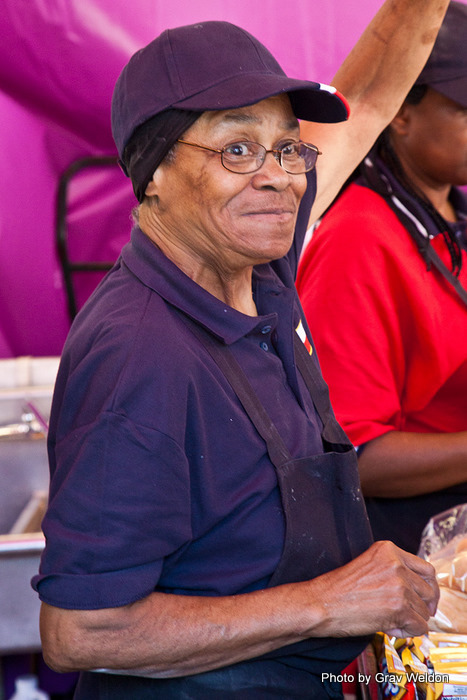 Ms. Ruth from Smokey Joe's has been making an award-winning chili for 49 years and if you ask real nice I bet you can get some of that on there, too. 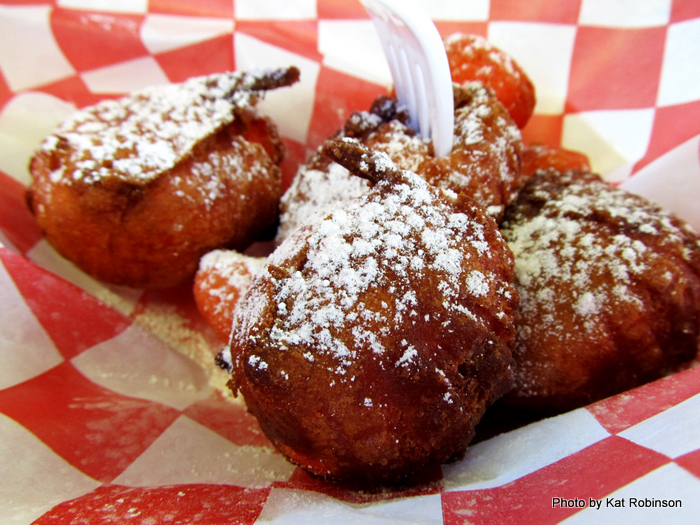 E is for Enough Already with Fried Butter. 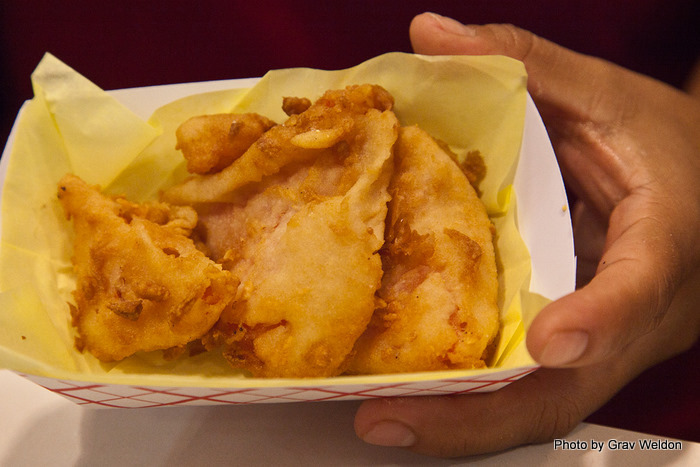 Not only can you get fried butter this year, you can get it in three separate flavors -- honey cinnamon sugar, garlic and cherry. 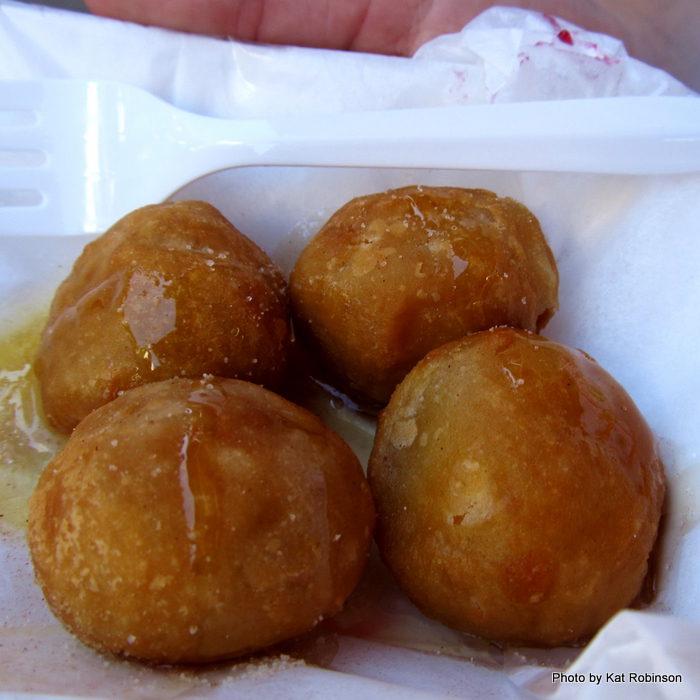 Did we really need fried butter? Thing is, unless you happen to bite in right at the moment it’s served up, it could be just about any buttery pastry. That butter melts quick. Let’s hear it for the novelty, though. If you must find them, they’re at the Big as Texas booths for 11 tickets ($5.50 for four). 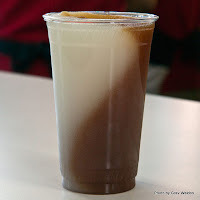 F is for the Frozen Arnold Palmer, a new twist on an old favorite that combines a little Southern Hospitality with the brain freeze of a Slushee. It’s a nice cooling and refreshing treat that isn’t a day-glow color for 10 tickets ($5) from the Frozen Sweet Tea stands around the fair. 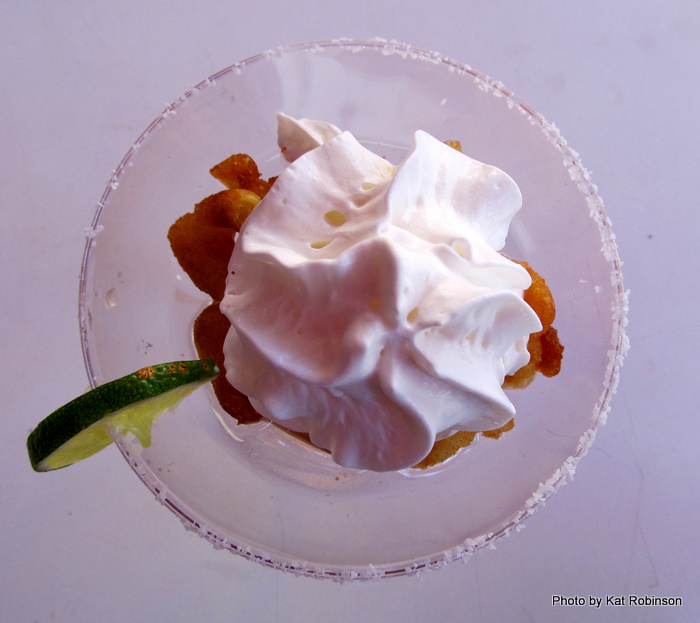 If you’re going to talk about frozen things, you should mention the Deep Fried Frozen Margarita. Jake at Desperado's Mexican Restaurant was explaining this to me. He takes the restaurant's signature frozen margarita mix (complete with tequila) and blends it with funnel cake mix. It's deep fried and served up in a margarita glass... with more frozen margarita mix (complete with tequila) poured over the top. Comes topped with whipped cream. You have to be 21 to try this -- it has about the equivalent of a shot of tequila in it. 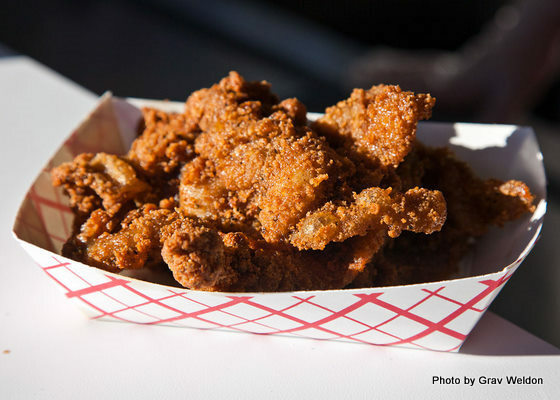 It’s one of the finalists for this year’s Big Tex Awards, and it’s 12 tickets ($6). 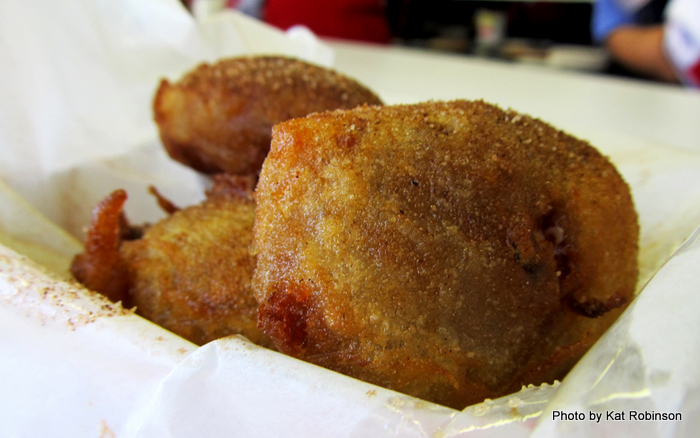 F is also for Deep Fried Frito Pie, another delight you'll find at Bert's Burgers and Fries. 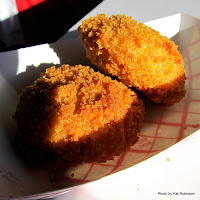 Last year's Best Tasting Big Texas Award Winner is a collection of Fritos topped with chili and cheese, battered and deep fried and served up with salsa and sour cream. Still just as tasty as always. At Bert's Burgers and Fries in the Midway Food Court. 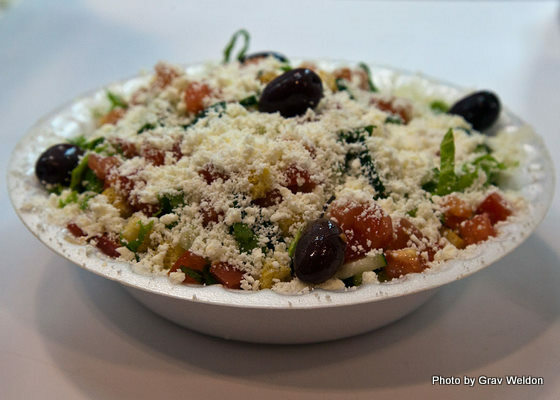 G is for the Great Dane at Thanasi's Authentic Greek Fare inside the Coca-Cola Food Court. It’s a splendid foot long dog covered in some of the best chili you’ve ever had in your life (and I’ve judged professional chili competitions, it’s that good). 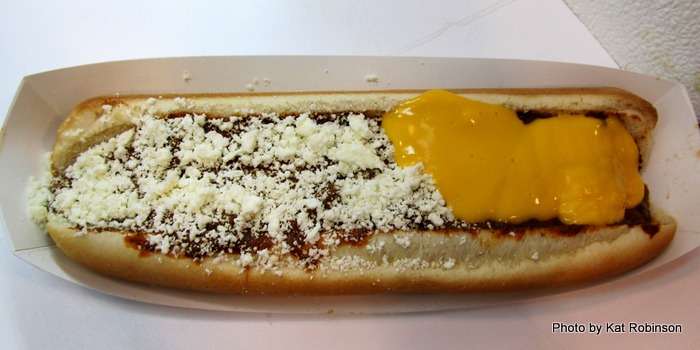 It’s topped with your choice of Feta or Nacho cheese -- or you can do a half and half like this dog. It’s a show dog, and it’s 12 tickets ($6) -- the small version is called the Chihuahua and it’s 10 tickets ($5). The same stand offers up another fantastic deal that will feed two people for 16 tickets ($8) -- it’s the Greek Salad, and it’s excellent. Shredded green leaf lettuce, chunked tomatoes, finely sliced cucumber, Kalamata olives, croutons and finely grated cheese. It’s a big bowl and worth the money. 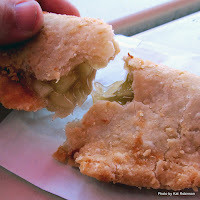 Oh, and while you’re there try another G -- the green filled Spanikopita (9 tickets/$4.50). G also stands for a sandwich. Both simple and complicated at the same time, the Deep Fried Grilled Cheese Sandwich is just cheese between two slices of bread, battered and deep fried. What makes it rock are the side items -- shoestring fries, a small bowl of tomato soup for dipping and a big dill pickle spear. It can be found between the north end of the Exhibit Hall and the Magnolia Beer Garden. H is for the Heavenly Deep Fried Brownies. 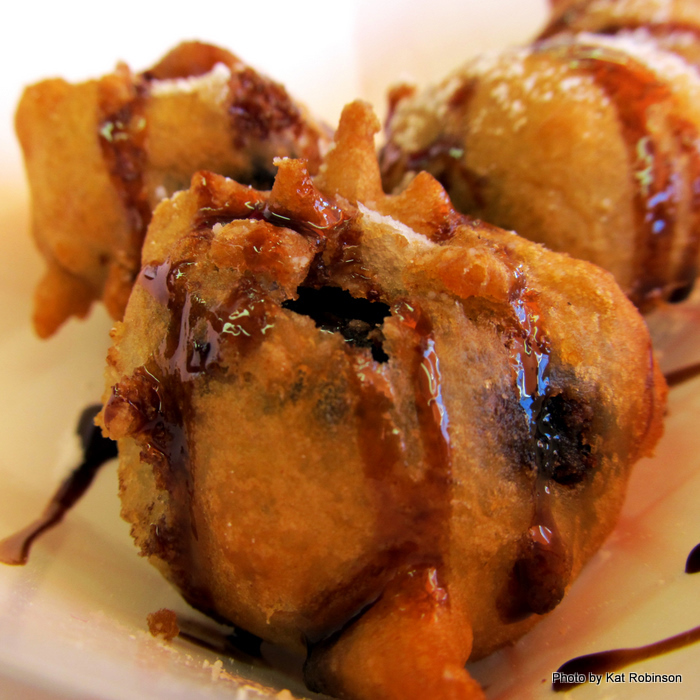 Dough is wrapped around a small portion of brownie, it’s deep fried and served up with a drizzle of chocolate four to a paper boat. Your serving will cost 10 tickets ($5) and you can find it on the north side of the Cotton Bowl at Ranchero Pizza. 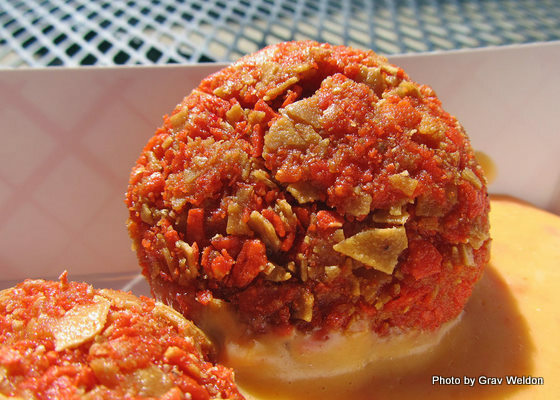 I is for Ice Cream, as in the Viva Las Vegas Fried Ice Cream. 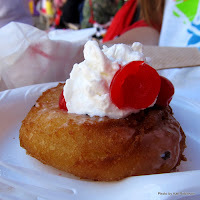 A big ball of vanilla ice cream rolled in cornflakes, dipped in batter, deep fried and then drizzled with whipped cream, chocolate syrup and sprinkles and topped with a cherry and a guitar shaped piece of pastry dough. It’s a lot of sweet, cold and hot together -- but you need to eat it quick or you’ll have ice cream soup. 14 tickets ($7) at Barrera’s on the Midway. J is for Jerk Tofu. I kid you not, there is indeed such a thing as jerk tofu. It’s slices of grilled tofu topped with a jerk barbecue seasoning and accompanied by three corn-packed hushpuppies. Vegetarian friendly, the tofu is all right but the hushpuppies are incredible. You’ll find it at the stand selling all the Caribbean food north of the Magnolia Beer Garden for 7 tickets ($3.50). K is for Kraut Balls. Oh, how I dreaded the idea of tasting these, and oh how I came to adore them. It’s tightly packed sauerkraut in a cornmeal batter, and it’s perfect -- combining the tartness of a good sauerkraut with the caramelized buttery flavor of fried cabbage. I could eat a dozen of these with some Russian dressing and be set. 10 tickets ($5) at the Hans Mueller pavilion east of the Cotton Bowl. K is also for Kool-Aid Balls. Impossible, I say. The weren’t entered in the Big Tex Awards (the vendor entered two other items). I have to tell you, these deep fried dough balls are a real surprise. The Kool-Aid infused funnel cake batter comes out tasting like a really strong and delicious strawberry cake. Underrated and filling. You can pick up a boat of them for 10 tickets ($5) at Bert’s Concession on the south end of the Midway. Can’t let go of K without mentioning Kebabs -- but not the normal meat-and-veg on-a-stick we’re all used to. No, I need to talk about Berrie Kebabs. 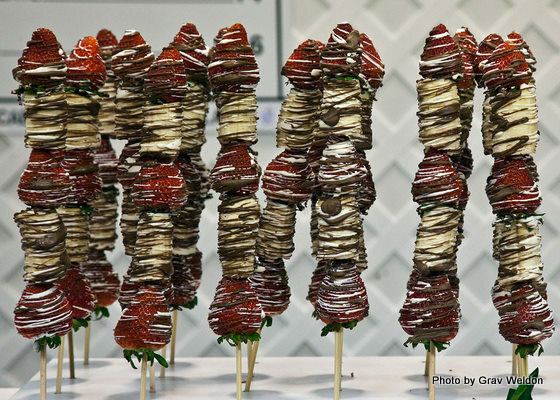 The bad spelling aside, I can’t see how anyone could really turn down one of these strawberry and banana packed skewers drizzled in white and milk chocolate. 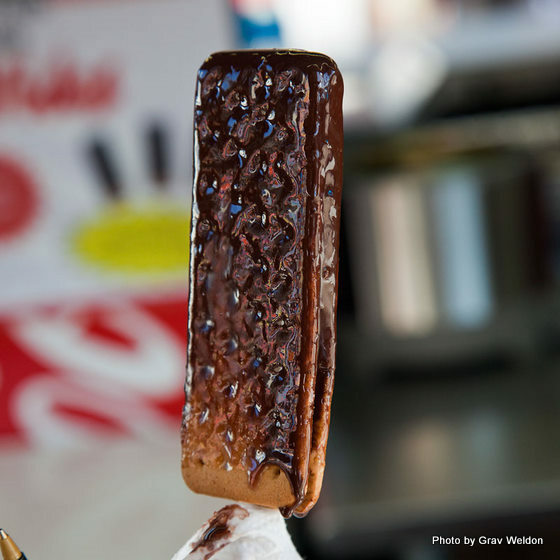 They’re 14 tickets ($7) -- as are the chocolate dipped cheesecake on a stick you can get there. Inside the Coca-Cola Food Court. L is for liquid things -- as in the Lemon Shake-Up. 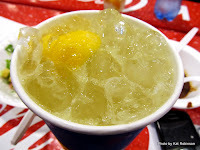 Yes, it is really just lemonade, and there’s been lemon drinks sold at fairs for decades. 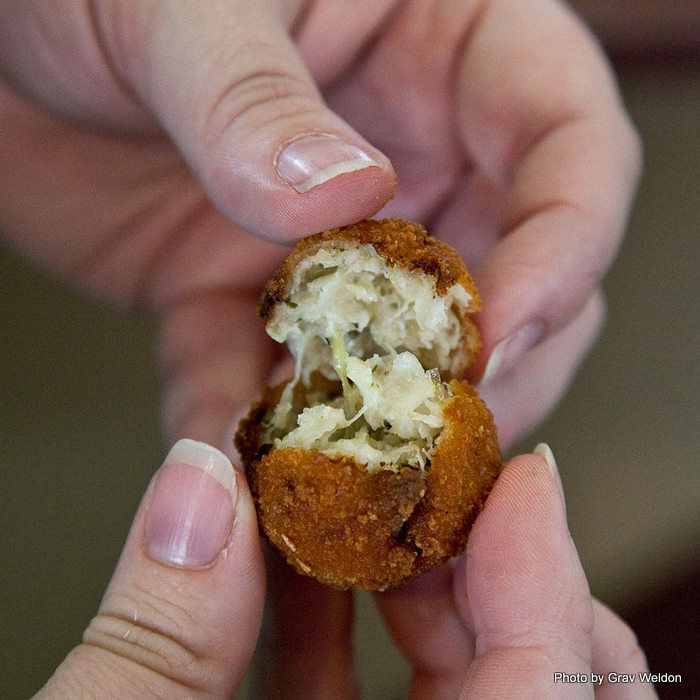 It’s still awesome, especially after you’ve consumed mass quantities of fried things. You can pick up one just about anywhere concessionaires are selling stuff for five to seven tickets ($3.50-4.50). Also, if you’re looking for cheap beverages, you’ll find a variety of fruit juices, milk, flavored milk and tea at the Oak Farms kiosk in the middle of the Coca-Cola Food Court for 3 tickets each ($1.50). The only other drinks you’ll find cheap are the water guys selling a cup of water or the Fried Bubblegum people who have coffee -- both at 3 tickets apiece. 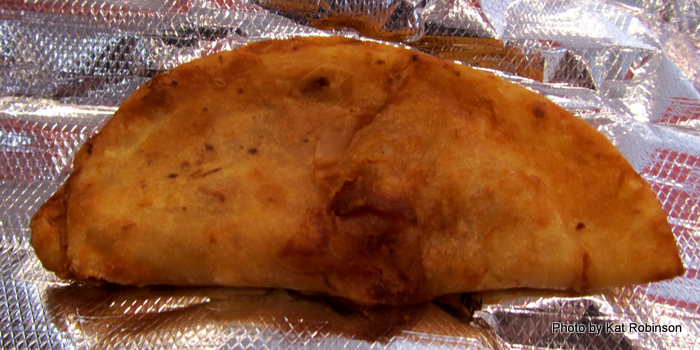 L also stands for one of the great food finds of the past, still just as good today -- Deep Fried Latte. The latte here isn’t actually deep fried, it’s implied, but remarkably well. 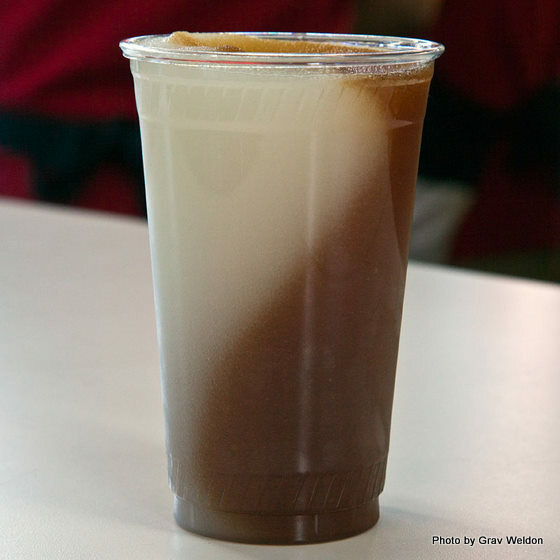 The 2007 Big Tex Award Winner for Best Tasting is a collection of ingredients that come together to create a decadently espresso-and-milk flavored dessert. It’s a sopapilla topped with cappuccino flavored ice cream and whipped cream, drizzled with maple syrup and instant coffee flakes… and yes, it does taste just like a designer latte. 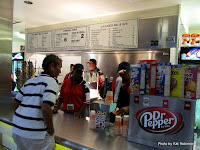 It’s 10 tickets ($%) at Desperado’s Mexican Restaurant stand east of the Cotton Bowl. M is for Fried Meatballs. Made by the Bert’s Burgers and Fries folks, this is the latest entry from the same folks who won the 2010 Big Tex Award for Best Tasting with the Deep Fried Frito Pie. 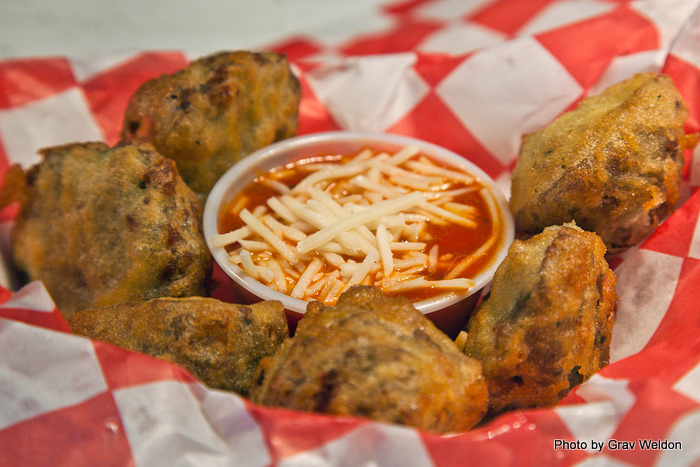 Big fat meatballs cut in half, dipped in batter, deep fried and served half a dozen at a time with marinara sauce and shredded cheese, it’s like eating a meatball sub without the bread. You’ll find Bert’s Burgers and Fries in the Midway Food Court, where it’s been for longer than I’ve been alive. 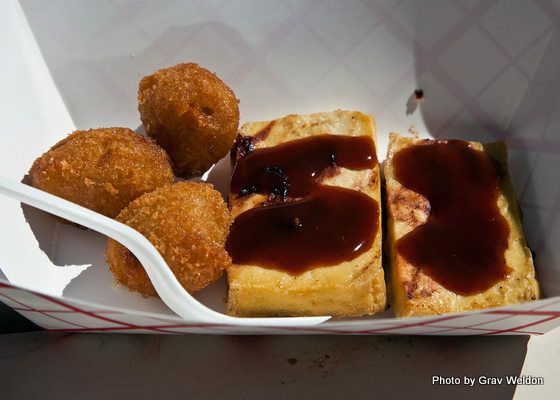 M is also for Deep Fried Mashed Potatoes and Gravy… yeah buddy. No joke here. Big balls of mashed potato injected with gravy and then battered like you’d batter fried chicken, deep fried and served up hot. If you look really close there you can see the gravy oozing from that ball on the left. If they started offering these at KFC it’d be their biggest seller. 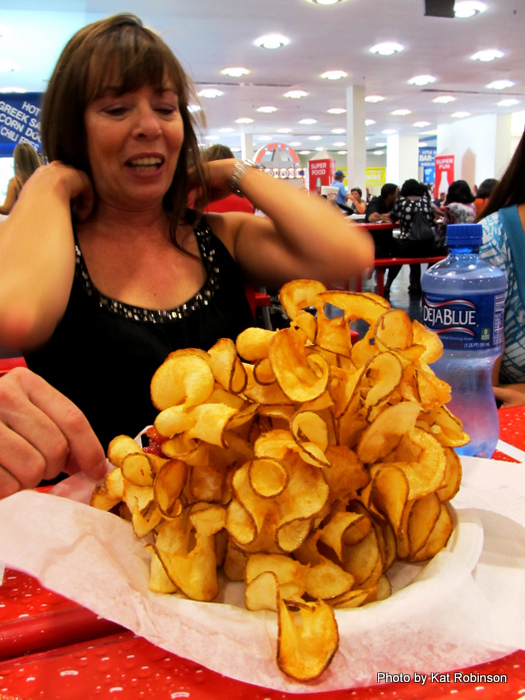 For now, you can get it at Eat Crispies on the Midway for 12 tickets ($6). And it's for the Deep Fried Moon Pie. Another Stiffler Brothers invention, the original calls for a full size banana cream Moon Pie, but now they also have chocolate and vanilla. The deep frying process makes the marshmallow explode a bit, so it comes out huge. 10 tickets ($5) will get you an exploded pie... the chocolate ones are almost like Fried S'mores. N is for nuts, as in the Texas Fried Pecan Caramel Plate. If you look closely, you can see the shape of Texas. The little thing is 14 tickets ($7) but it's actually a densely packed deep fried candy. Really. It's a hard pressed caramel between those tortilla-like crusts. Powerful. You'll find it at Barraras on the Midway. Then there's the Chocolate Nut Fudge. 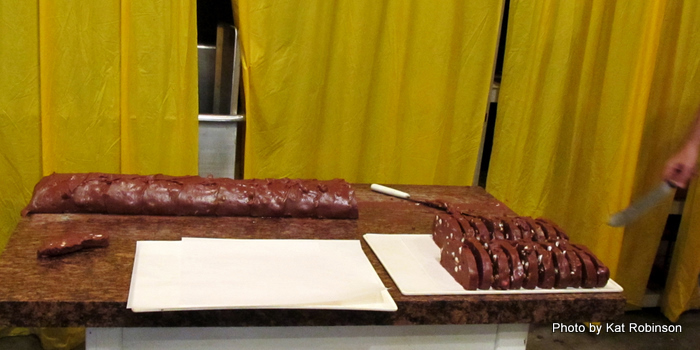 This is a log of chocolate fudge being cut up at the fudge stand inside the Exhibit Building. I don't think I've ever seen something so massive before made of fudge. Probably weighed 25 pounds or more and it smelled sinful. $6 a slice, two for $10 or buy 3 get one free ($18 for four) -- and it's one of the few places at the fair where you must pay cash, not tickets. O is for “oh, why didn’t I think of that?” As in Fried Chicken Skins. I kid you not. For 12 tickets ($6) you get yourself a boat of hot, crispy, fresh out of the deep fryer breaded and deep fried chicken skins and nothing else. You know you wanna. I cannot think of a more evil yet tasty item. And then there's the Fried Cheesecake. I mean, how else could you make cheesecake better than to heat it up? 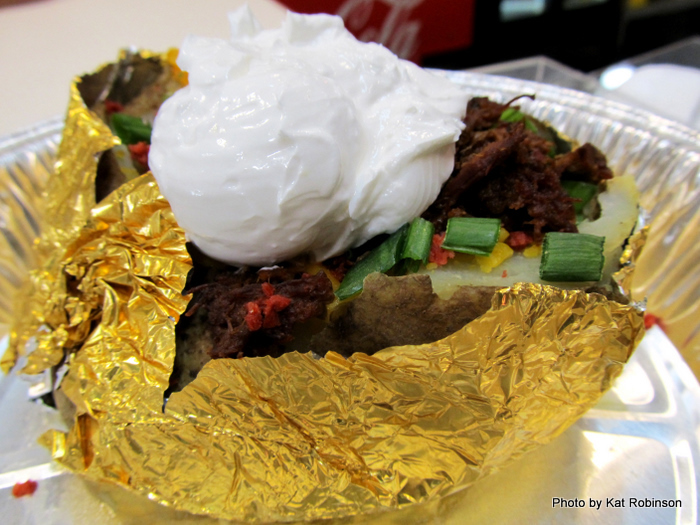 Wrapped in a wonton-like dough, this popular dish from Bert’s Burgers and Fries on the west side of the Cotton Bowl is both tasty and easy to eat. We loved the melty flavor of the real cheesecake and the fact that it didn’t go all over the place. Bert’s, by the way, has been at this location for 35 years at the Fair, though the Bert family has been participating in the Texas State Fair since 1919, originally with a cafeteria and roller rink. P is for Pig Poppers -- Similar to the Pig on a Stick we found at the Arkansas Oklahoma State Fair, but with a gourmet twist. 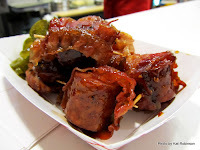 These are bacon-wrapped section of Hans Mueller sausages that are deep fried and served up with jalapeno slices the folks at Bailey’s candy themselves. They're 14 tickets ($7) and you'll find Bailey's inside the Coca-Cola Food Court. Then there's pudding, as in the Deep Fried Banana Pudding. 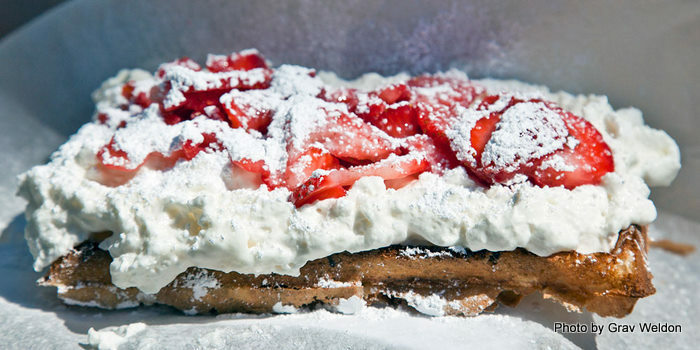 The pudding is wrapped in the tortilla, it's fried and then whipped cream and powdered sugar are added. I heard someone going on and on about how it was this fantastic crepe. 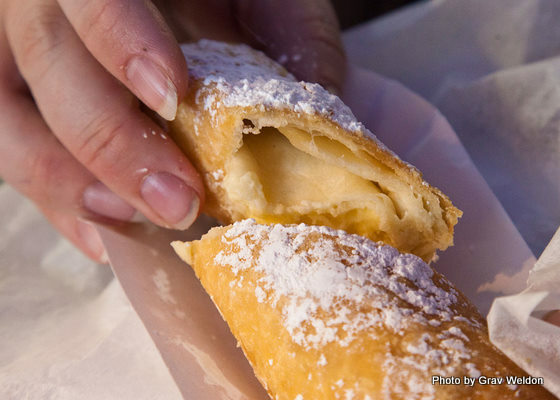 Face it -- it's a banana cream hand pie. Really. But sweet. It's 8 tickets ($4) at BW's Famous Fried Ribs in the Coca-Cola Food Court. 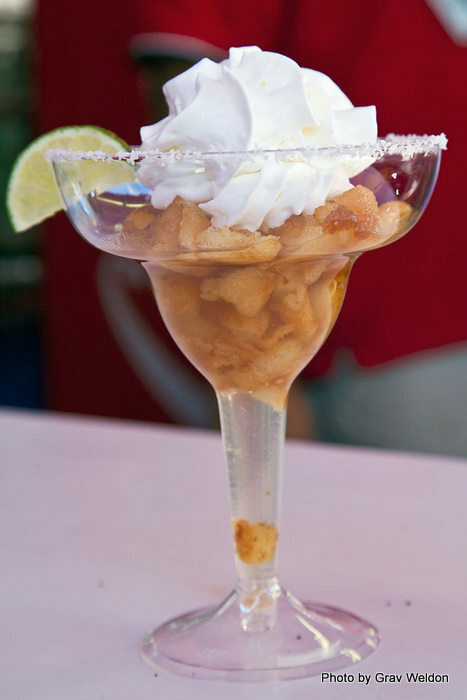 And of course there's another finalist from this year's Big Tex Awards -- Deep Fried Pineapple Upside Down Cake. One of my favorites. It's actually quite small. It's a thick ring of pineapple dipped in cake batter, deep fried and served up with cherries and whipped cream -- and it is dead on right. I could inhale these things. They're 6 tickets ($3) so they're not exactly going to break the bank. Find it at Big as Texas booths. P is also for pickles. Pickles are in this year. 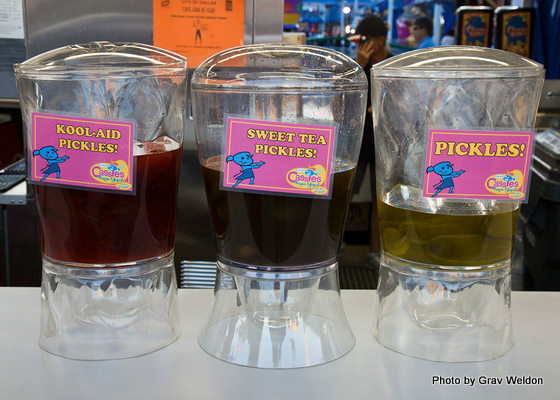 In addition to traditional pickles and the Kool-Aid Pickles that came out at last year's North Carolina State Fair, there are now Sweet Tea Pickles, which are somehow more tart and flavorful. We only found this variation at Cassie’s Fun Food along the Midway. It’s tarter than a Kool-Aid Pickle but with an additional sweetness that anyone who loves sour suckers is going to adore. Four tickets each ($2). 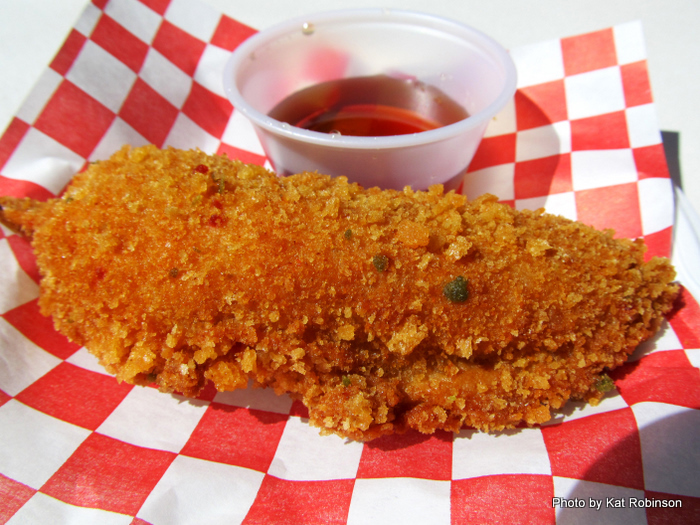 Q is for the quirkiest food we found, Buffalo Chicken Flapjacks on a Stick -- this year's Big Tex Award winner for Best Tasting. It looks innocuous enough, but that right there is a Buffalo Chicken Flapjack... on a Stick. 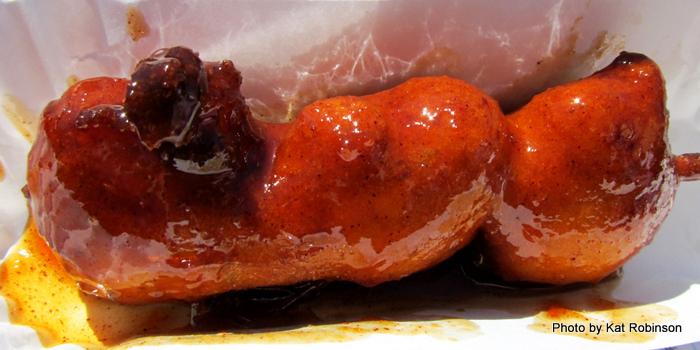 It's chicken that's been marinated in Buffalo sauce, battered and rolled in Jalapeno bread crumbs, deep fried and served up with a side of maple syrup. Well now. R is for the red pair of Salsa Balls. These are interesting and tasty. Two of these 3 inch Salsa Balls are served up in a pool of queso in a paper boat. Found in the Magnolia Beer Garden. They taste like balls of just tortilla chips and salsa. 10 tickets ($5) and they're yours. It's also for ribs, as in Fried Ribs. Found at BW's Famous Fried Ribs in the Coca-Cola Food Court, these are literally just seasoned pork ribs deep fried and served up hot with French fries for 18 tickets ($9). Either original or hot and spicy. There's usually a line at this stand. 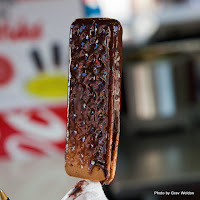 S is for the Sweet Jalapeno Shrimp Corndog from the Belgian Waffle folks. That's right, the folks that brought you fried beer have come up with something far more palatable this year -- a corndog with three shrimp instead of a weiner inside the batter. The whole mess is dipped in a sweet jalapeno sauce right before serving. Tastes a bit like General Tso's Shrimp. At 12 tickets ($6) it's more expensive than a regular corn dog -- but it's still pretty darn unusual. Another strange S food on a stick is the Deep Fried Shrimp Cocktail on a Stick. Shrimp, cocktail sauce-infused tomatoes and onions are battered and deep fried and served up on that stick. That... is further than I think I'd go with shrimp cocktail, but that could just be me. It's 10 tickets ($5) at Festival Foods on the Midway. S also stands for sweet potatoes -- and there are two big sweet potato purveyors out there. 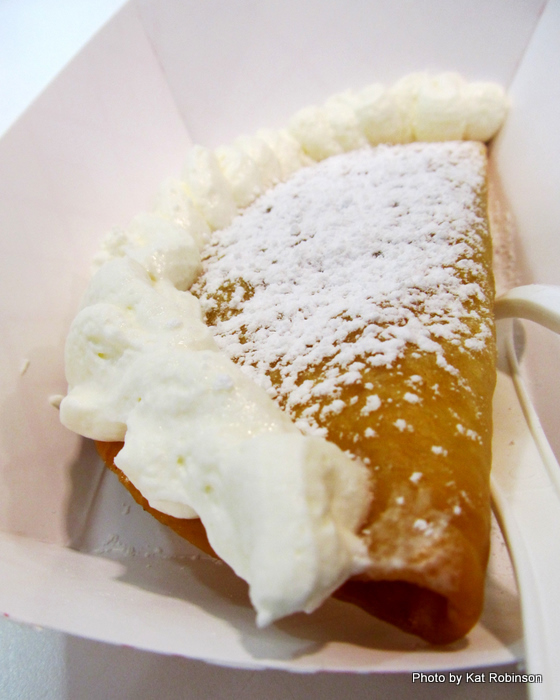 One is Mama's Fried Sweet Potato Pie in the Coca-Cola Food Court. It's a big fried pie that usually comes with brown sugar and whipped cream, and it is packed with sweet potato filling. Get yours for 7 tickets ($3.50). 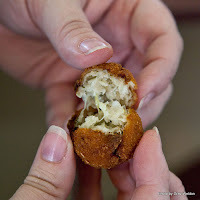 A better and more unique application -- the Praline Sweet Potato Poppers. The filling of a sweet potato pie is paired with the goodness of a great pecan praline coating. Almost candy-like. They're 9 tickets for three ($4.50) and they're just divine. Of course, if you're going to talk about sweet potatoes you might as well talk about stuffed potatoes -- and that means Barbecue Stuffed Potatoes at Little Bob's. Little Bob passed away just a few weeks ago but his crew is still going strong. This is a barbecue stuffed baked potato offered at the Little Bob's booth at the Coca-Cola Food Court. If I'd had room I would so have been about picking up some of that Barbecue Beef Bologna on the menu. 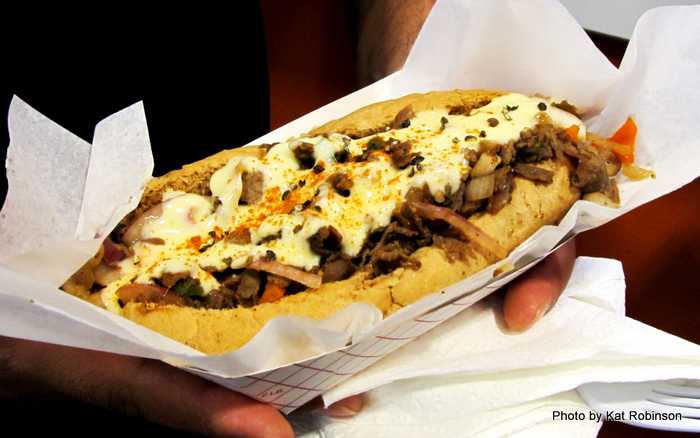 And then there's the Shaggy Dog (12 tickets/$6 regular, 14 tickets/$7 footlong). 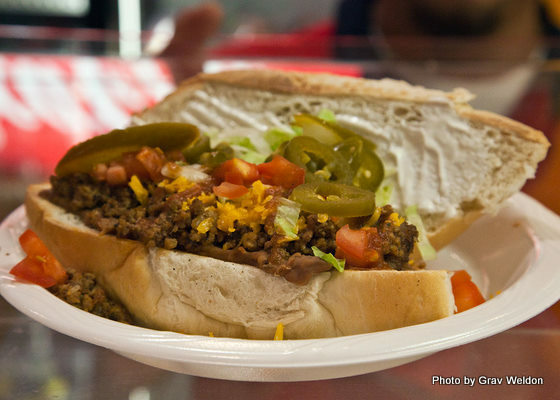 This is a Nathan’s beef casing-free hot dog (regular or foot-long length, topped with a Frito chili pie. We’re amazed no one ever thought to combine the bread and meat combination of a hot dog with a corn chip, cheese and chili combination of a Frito pie before. It works. You’ll find it at the Texas Chili Parlor inside the Coca-Cola Food Court. 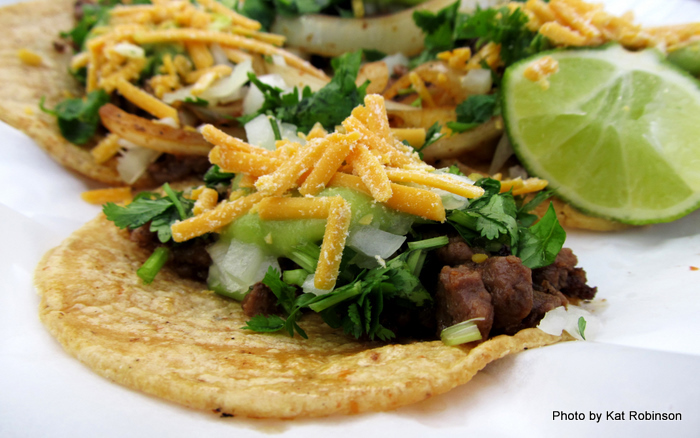 T is for the Torta-- It’s like a taco, but it’s not. Ground beef, seasoned beans, cheese, jalapeno peppers, tomatoes and sour cream served up on a section of French bread makes a very hearty two-handed sandwich. 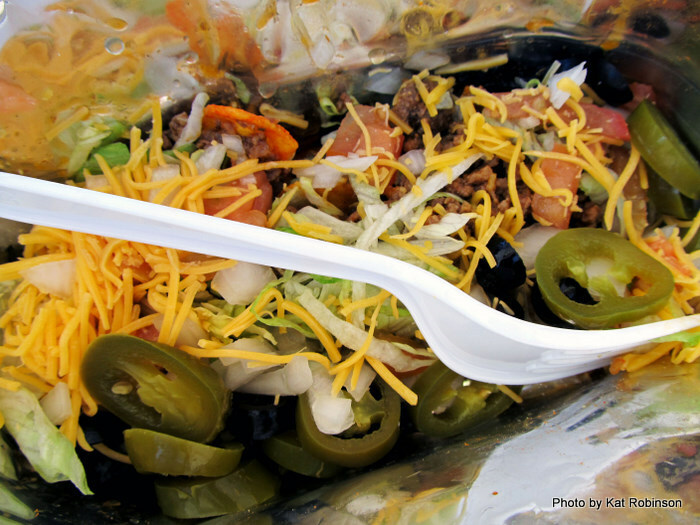 You’ll find it at Ranchero Gordita in the Coca-Cola Food Court for 13 tickets ($6.50). They also do Gorditas (10 tickets/$5) which is a gigantic soft taco with the regular fixings served up in a handmade tortilla. The Torta and the Gordita both come with your choice of ground beef or grilled chicken. T is also for Twisted Tators -- and you have to see this. While we were taking a short break off our feet at the Food Court, the lady sitting across from us brought over her Supreme side order of Twisted Tators. The photo really does speak for itself -- she had put some ketchup on the side but barely had room because of the plethora of potato-ness on the plate. Impressive. 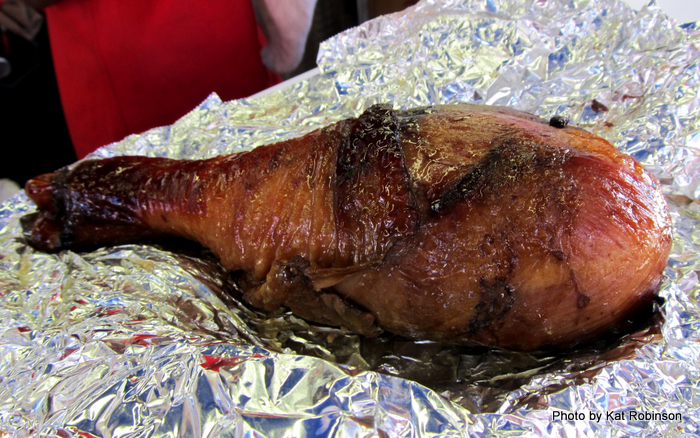 Another T would be Turkey Legs -- which you'll find all over the fair. The best ones we found were at Benavidez, across from the swings on the Midway. Big, fat, juicy and fragrant, it's the best way to feel like a caveman (plus, if you wrap yours up tight it looks like an aluminum club). And then there are Mini-Taquitoes -- four fried corn tortillas topped with beans, lettuce, cilantro, onion and Cheddar cheese with a little bit of lime. They're 16 tickets for four little four inch rounds ($8), so choose accordingly. Located at Lupita's Gordita's in the center of the Midway. U is for the Ultimate Fried Burger. 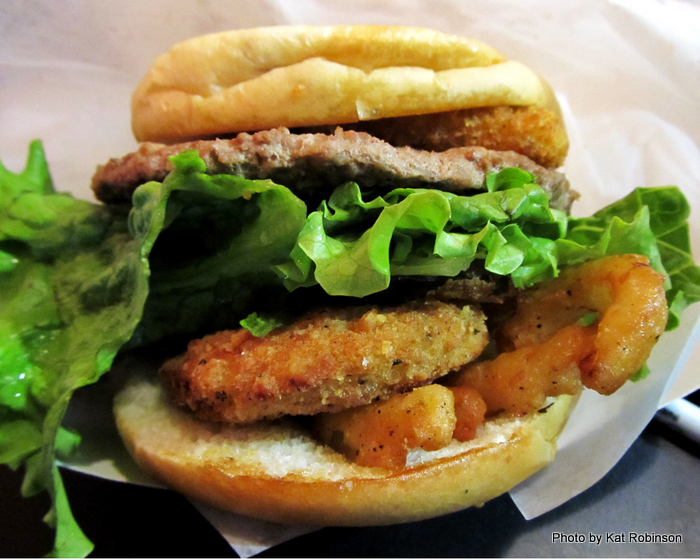 Everything about this burger is fried save the bun and lettuce. 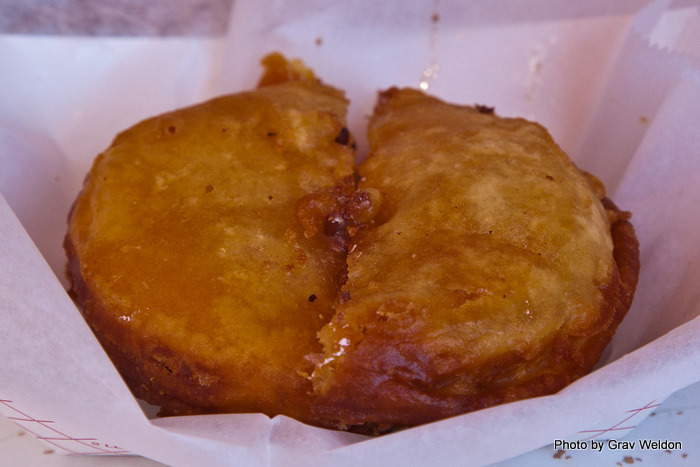 The flat third-of-a-pound patty is griddle fried. 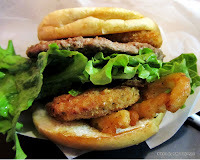 Deep fried pickles, fried green tomatoes, fried onion strings and fried cheese triangles are added along with a big slice of green-leaf lettuce. The whole thing comes out similar to a Fat Darryl in flavor; we suggest you load up on the condiments offered at the counter, it’s a little dry. You’ll find it for 15 tickets ($7.50)at the Oasis Restaurant inside the Auto Show, behind the Toyotas and such. 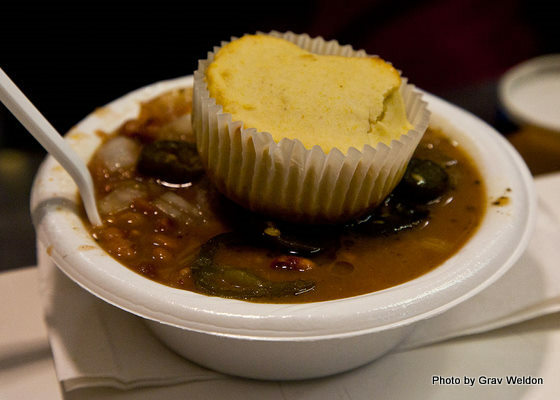 V is for vegetarian fare, such as Blackeyed Pea Soup. Is there a truly vegetarian item at the Texas State Fair? Several, actually. This is Blackeyed Pea Soup from Bailey's in the Coca-Cola Food Court. It's a nice thick soup with carrots, celery and onion along with spices and a jalapeno pepper float, served up with a corn muffin. A filling hot meal for the meat-less set for just 8 tickets ($4). W is for the Walking Taco. Introduced for the first time at the Texas State Fair this year (introduced at the Arkansas State Fair in 2009), this is a bag of Nacho Cheese flavored Doritoes opened up along a side and topped with ground beef, lettuce, tomato, cheese, onions, black olives and jalapenos. Constructed when you order it, if you’re meat-free they’ll hold the ground beef for ya. It's 12 tickets ($6) and you'll find it at the orange booth on the south side of the Cotton Bowl, right next to the Fried Bubblegum stand. Then there's the Belgian Waffle... 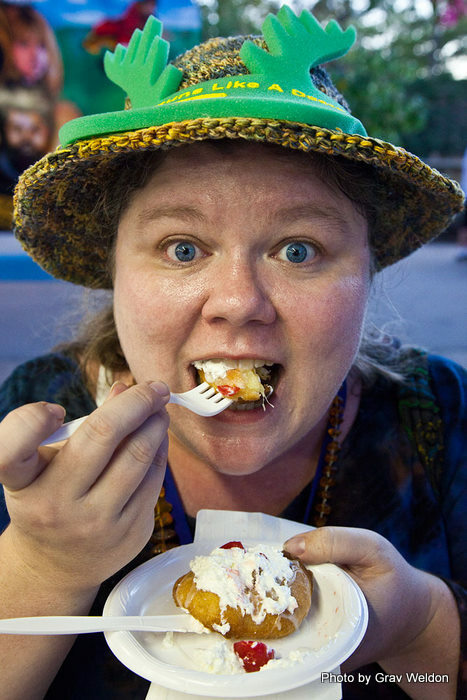 I'm really not sure about the allure, but waffles are popular enough at the Texas State Fair that there are a couple of Belgian Waffle stands. It's like breakfast in the palm of your hand -- a foot long waffle topped with a selection of items, usually whipped cream and a fruit of some sort. No plates here -- they're just handed out with a napkin and it's your turn to deal with them. And then there's Black Walnut Taffy... as in Sutter's on the south side of the Cotton Bowl. Another place that's been there longer than most of us can remember -- and a big 14 ounce 20 ticket ($10) box will last you a long time. Pick and mix from Vanilla, Chocolate, Banana, Strawberry, Black Walnut, Pecan, Peanut Butter, Cinnamon or Peppermint. 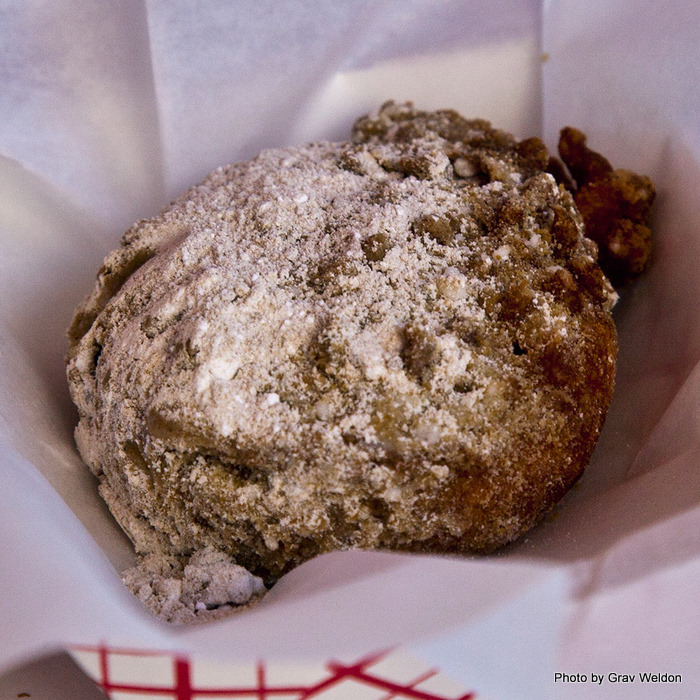 And then, there was Deep Fried Watermelon. 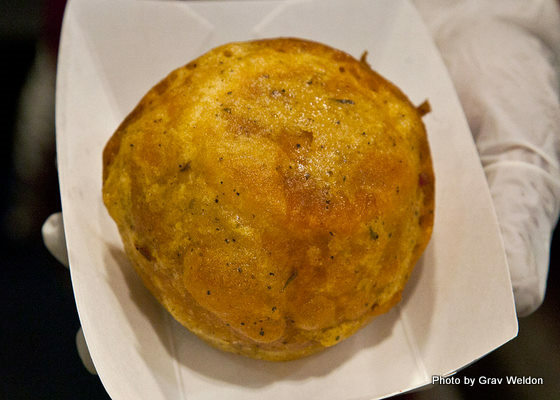 I really don't know what to say about it... except it looks like an excessively deflated fried dumpling. Somewhat tart, considering, the water from the watermelon just seems to evaporate right away. Also available in the Coca-Cola Food Court, from the same folks who bring you Fried Peach Cobbler on a Stick. X is for the extra long name we found for a simple treat… the Peanut Butter and Jelly Sandwich in a Graham Cracker dipped in Chocolate. This here is a Peanut Butter and Jelly Sandwich in a Graham Cracker dipped in Chocolate. I think the Chocolate Covered PBJ would be a better name. Tastes like a Peanut Butter Twix Bar. It's 9 tickets ($4.50) and it can be found at Benavidez next to the swings on the midway. 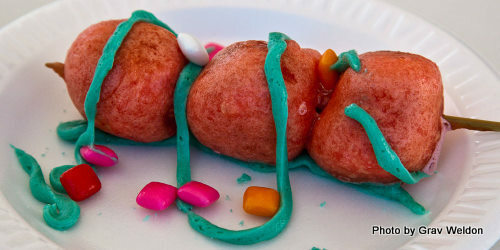 Y is for, really, WHY did we need Fried Bubblegum? Pink bubblegum infused batter over pink bubblegum flavored marshmallows, deep fried and drizzled with blue bubblegum icing and sprinkled with more bubblegum. I thought this was bad but not too bad on first bite -- but it stuck with me for hours. Awful. You should go read what I wrote for Serious Eats on the subject. If you really want to try it, you'll find it at the orange booth on the south side of the Cotton Bowl. It's 9 tickets ($4.50) for those three little balls, though I can't imagine why you'd want to try it unless you're under the age of 10. 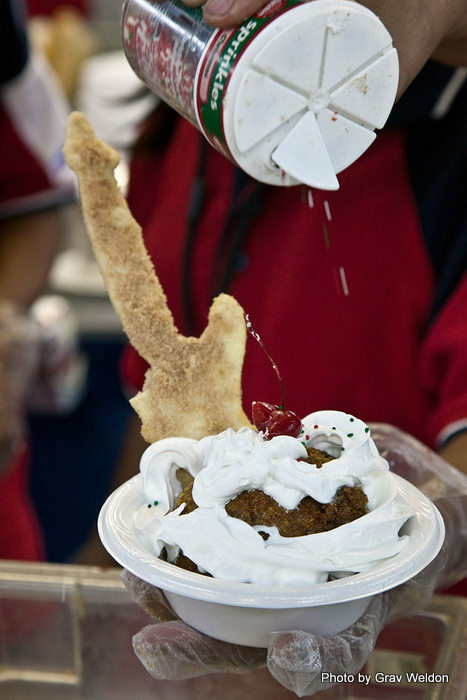 Z is for the be-all and end-all of fair food, Fried Oreos, one of the first things to ever be battered and deep fried for the Big Tex Awards years ago. It's nice to be able to enjoy a classic. What can I say? These, by the way, we found at Barrara's on the Midway for 8 tickets ($4). For more information and to see the 25 best, check out the article we did for Serious Eats. Oh my. Not only would I be sick afterwards, but I would have to take out a second mortgage on my house. What an interesting variety of food! I sure do hope some of this makes it to our fair this month. Great article -- besides the cruise ship one earlier this year, I don't remember an article by you that was so long. Also, great job on the photography! Ha! Great post! Thank you for leaving a comment on my blog! I was fascinated with this detailed list and found it very helpful! Thanks. Oh wow! That a great and detailed list of food from the fair. I love the food there, I got to print this out and check each thing I try each time I go. WOW! I thought the Ark state fair was diverse...........but everything is bigger and better in Texas ;). Such a list with so many fried items that I would never think would be good a good combo.....crazy but good :).